Quick trip, but an exciting trip! We decided to make a quick trip to the property last weekend to check on everything and take a load of miscellaneous ‘stuff’ including the leftover tile from our previous tile projects. Turns out we had a lot of leftover tile (about 1500 pounds). I will get to why that is important in a moment. This was the first trip with the new truck towing a trailer so I was excited to make the trip. 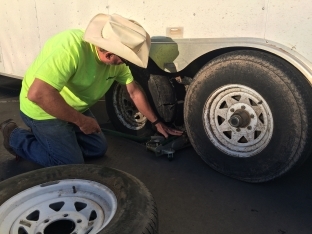 The trip started with severe trailer towing issues less than 10 miles into the trip. Not really thinking about how much tile we had leftover Marty and I had loaded the tile last into the trailer near the back which was causing the problem. So after 15 minutes of moving all that tile farther forward the trip proceeded with no issues. We made a quick stop at the closest hardware/lumber yard (one hour from the property) to begin talking to them about the materials we need. That went well and I am now preparing a bill of materials so they can price it all up for us. We decided to head to the pie shop before heading to the property to get some pie and say Hi to everyone. Weather was good with some clouds in the sky but nothing that would cause me any concern. Immediately exiting the truck we were told that it had just hailed and we could see the hail on the ground, still no concerns. We had our pie and visited with the owners and during that conversation it was mentioned that there had been rain most of the preceding week, still no concerns. We finished our pie and headed to the property. There are two ways to get to our property and of course I took the nearest road from the pie shop. The road begins with a few hundred yards of asphalt and then turns to dirt. Well as we approached the dirt it became obvious that we were in trouble. The dirt road (this is a main road) was a mess! Ruts were up to a foot deep, it was a mud bog. We were now committed. Luckily we now had 4 wheel drive at the touch of a button and we only had a half mile to our turn-off. We made it to our turn-off with no issues and the access road was in much better shape than the main road so I felt confident! We were now less than two miles from our property and moving good. 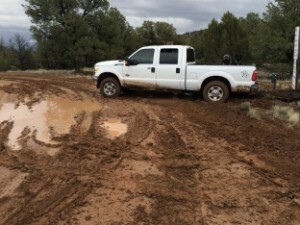 Then it hit me, just on the other side of the knoll was a 90 degree right hand turn that many times is muddy with just a little rain so I became concerned about what we would find. Cresting the knoll my greatest fears were confirmed, mud and water at least a foot deep was ahead. 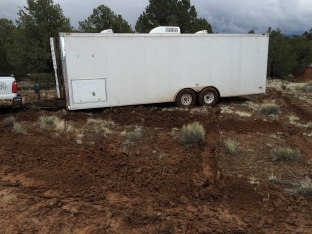 I maintained good speed around the corner considering the fully loaded 24′ trailer I was pulling (I told you the weight would come back to haunt us later) and made it through the mud hole. Now the grade started to increase and as much as I tried I could not get enough speed to climb the next hill so 100 yards past the corner we were stopped! The tractor was now getting really hot and it was not able to pull any more so we drove the tractor behind some trees to let it cool off and spend the night out of sight. At this point Joyce wanted us to leave everything until morning as it was approaching evening. What she had not seen was the major storm headed our way that I was able to see from higher on the mountain. I was getting desperate because I knew if it rained any more we could be there for days! So I ran back to the property and grabbed the Jeep and a 20′ chain. Arriving back I had Joyce drive the Jeep onto the bank past the mud puddle and we began pulling slowly but the trailer was slowing sliding toward a speed limit sign and once we got within a few inches of the sign we had to start over and back the truck and trailer up again toward the ravine. This time I headed away from the sign more and after 10 minutes of slowly working the truck and Jeep we were able to get back on the road and head back to the main road! Total time roughly two hours. We made it to asphalt and headed to the other entrance to the property. I had no concerns again as in the last eight years of visiting our property we had never had an issue with the other road. 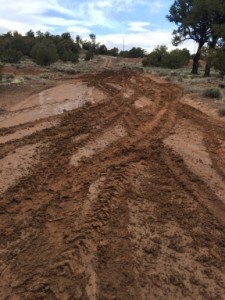 We turned onto the dirt road with no major concerns but as we traveled the two miles to our property the road got worse and worse. Luckily most of it is fairly level and the hills are mostly rock. 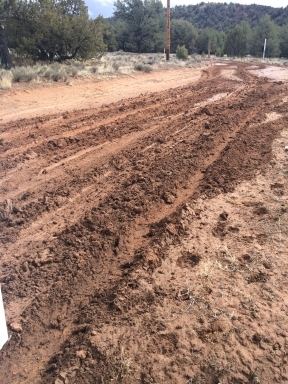 But as we approached the final uphill to our property the road became a slimy, muddy mess. 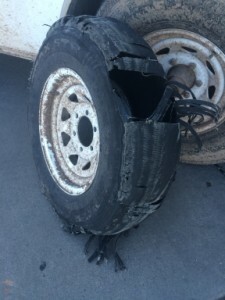 The truck wheels were spinning and we were barely moving but I was not stopping, we were 1000′ from our entrance and I was determined to make it! We did make it and our roads were in great shape. Shortly after we arrived it started to rain, we had just made it. At this point I was done! It was only 6:30pm but I went to bed and didn’t even have dinner. We survived the flat and made it home Saturday afternoon with no further issues. 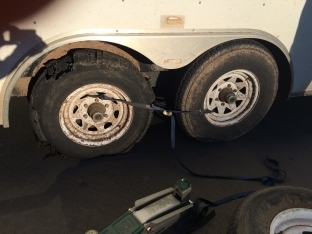 Sunday morning we spent four hours washing the truck and trailer with a pressure washer and hose, what a mess. I think we got 99% of the mud but I am sure there is more hidden somewhere. Our next trip will hopefully be in April when we hope to do more prep work, we are still hoping for a May start. During this multi-year planning process we have come to the conclusion that we will be hauling a lot of material in our trailers. 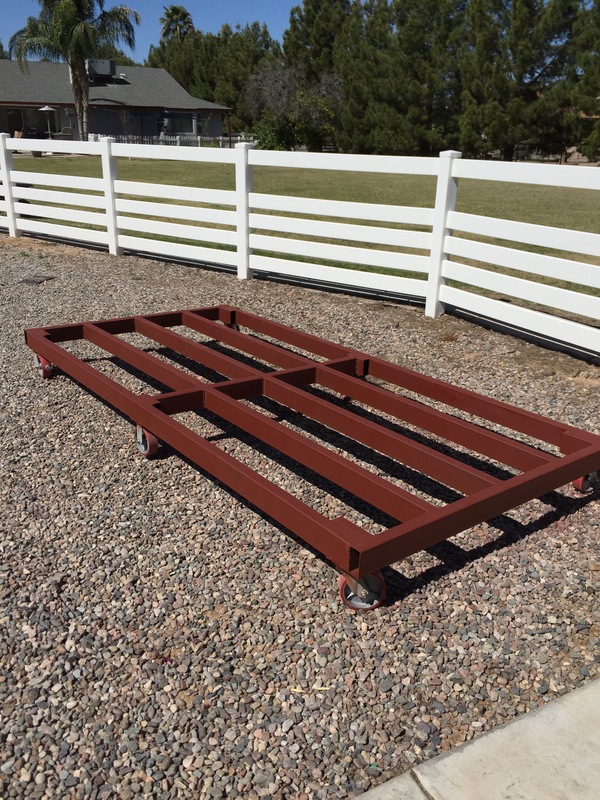 Being that we are not getting any younger and remembering that my Dad always told me to work smarter and not harder, I decided we needed a system so that we didn’t have to load lumber or other materials one at a time into the trailer. That is when the material trailer was born. Realizing that our enclosed airplane race trailer has a winch built into it, why not use a small flat bed trailer that could be loaded at the building system store with pallets of materials and then pulled into the enclosed trailer with the winch and reverse the process at the build site. Wow, my back started thanking me immediately LOL!